1. Was it copied under the "Fair Use" clause of copyright? Basically, this clause says that people have limited rights to use your original content as long as the use of your content is deemed "fair". "In short, using short, attributed snippets of a piece for the purpose of commentary or education is generally considered fair use. However, reprinting an entire work without attribution for the purpose of self-promotion or profit isn’t. The shorter the amount copied and the more it is for the purpose of commentary or education, the more likely it is to be deemed fair use." 2. Check the piece of content and assess how much of it has been copied/used. What was copied? A blog, an eBook, article, video, presentation, event agenda, etc. Was it a blatant and straight copy / paste exercise? Did they credit you in any way? Ultimately, if it was not under the "Fair Use" clause, would you care to go through the process of getting it rectified/taken off? If so, continue. 3. Do a print screen or get a copy of the piece including the date and the time it was published. b) What/where/when your content was used incorrectly. 4. Is the website where the content is published more popular than yours? If it is, then you need to make a judgement call on whether that was beneficial or detrimental to you or your business. See if the content that has been copied has generated links / traffic or social engagements, what the context in which your content has been used, etc. If it you realise that it could be beneficial, then it is probably best to seek "proper" attribution and link to your site. This will actually help your SEO. 5. 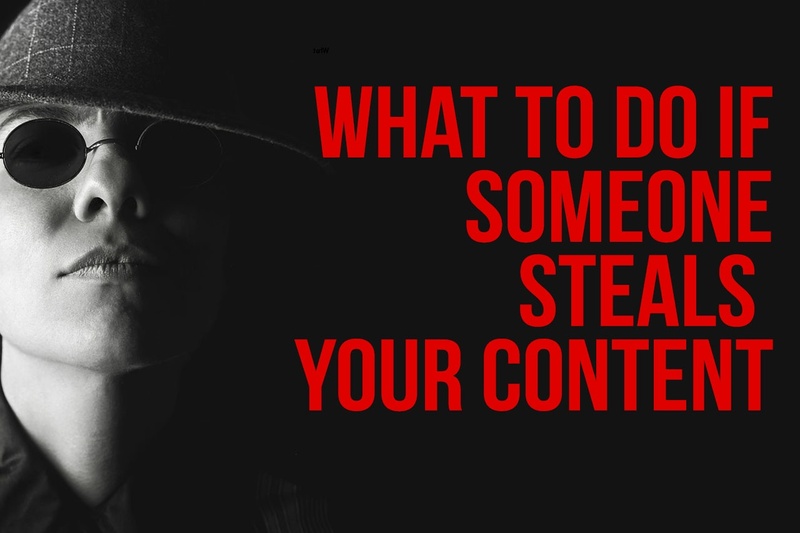 Find out who the author (or thief) of that content is, and reach out explaining the action you would take. Many pieces of content will have the name of the person that wrote it and subsequently a profile and if not an email address or a social media profile. So ensure you have means to reach out to that person directly. Try to put any emotions aside and explain the situation in a professional BUT firm manner and the action you want the person to take (as per item 4) . 6. Contact the owner / host of the site. If the content is on a public corporate site, you will certainly have means to contact the owner or host directly. If not, the next step is to check the WHOIS registry, a public database of the owners of web domains. 7. If there is no resolution, report it Google and request a removal of the content from their search results. If you get no traction, the last resort is to put in a legal removal request via Google. The truth of the matter is that if the content is blocked from the search engine, then most of the damage would have been mitigated. You will get credit for your content and the thief will not get traffic from Google to that particular piece. Now from the other perspective: What is the etiquette for using someone else's content? If you are intending to use someone else's content, you should really request their written permission to do so. If you do not want to ask, ensure it is "Fair Use" and provide links back to the original source. It is okay to copy and paste someone else's content as long as you are referencing only parts of it to provide context or comments in your own piece. With infographics, photos or images, you can use embedded features from the website you are taking the content from and you will be okay. In this game, we all know how important it is to produce sticky, good, value-adding, insightful content. Many of us go to great lengths to produce it. The reality is that we all want our content to be used, mentioned and repurposed somehow - but all we want is to be given some love. That's the right thing to do and everyone wins if it's a joint effort! The outreach will be much greater. Has this happened to you? What have you done and how have you solved it? Is there anything you would add to this piece? Let us know in the comments.